Rosemont’s Parkway Bank Park entertainment district will celebrate the summer with the return of the “Rockin’ in the Park” free summer concert series. The Park will host free concerts on Thursday evenings from May 30 through August 29, featuring music by classic cover bands, food and beverage tents on the park’s great lawn and a musical fireworks display after every show. 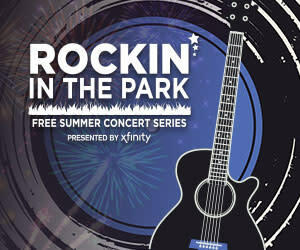 All “Rockin’ in the Park” concerts will run from 7 p.m. – 10 p.m. Admission to “Rockin’ in the Park” is free. Outside food and coolers are prohibited. Parking is available at the Parkway Bank Park parking garage and is free with validation from any of the park’s venues.